So one of our biggest problems as a family of five is balancing the books. What comes in doesn’t quite go far enough every month leaving us short and the credit card takes the strain. Sound familiar? What do you do? Well…you either earn more or spend less or do a combination of both. For us, we’ve already looked at all our fixed bills like rent, electricity, car insurance etc. and we’ve got everything as low as possible bar moving into a yurt! (…and don’t laugh – I’ve even looked into this!). So apart from earning more working around the children (which I am exploring) all that is left now is to save cash on the family food bill. I’m a child of the seventies who grew up in a working class family in the north east (UK) so I am used to ‘making do’ and can use those skills from childhood. 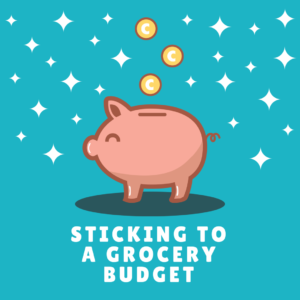 But there are also literally thousands of blogs out there on living the frugal life and how to save on your grocery budget so we’ll tap into those later on. I guess if I’m honest though, I do get a bit fed up with the rising cost of living. Anyway that’s enough moaning, it is what it is, unfortunately we’re in the same boat as so many families in Britain today. We’re earning but ‘just about managing’. Well not even that really – we’re NOT just about managing, we cannot make ends meet. So…for this April I’ve set myself a strict budget for food for us all and I intend to stick to it. Doing this will in theory mean we break even by the next pay day and not run out of cash as usual. Meal Plan like Katy Kicker does. 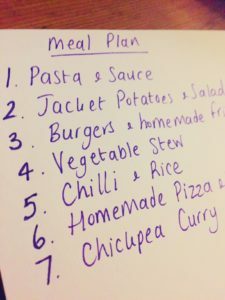 Katy says “Meal planning is a fantastic way to save time, money and effort. Best of all you get the smug satisfaction of having a meal on hand anytime”. I have read other bloggers talk about not meal planning and just picking up whatever offers are in the supermarket when you go and making a meal around those but I just don’t think that’s viable for my vegan family so I’m sticking with Katy and having 7 meals planned using whatever is left in the cupboards and my essential weekly shopping list. 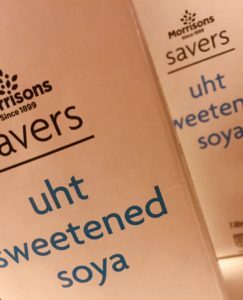 I also have a 15 month old so I need to shop quickly and have a plan ahead of our ‘mission’ to the shops – and a tub of rice cakes for little one when he gets bored of helping! Buy Yellow Labels like Emma Drew does. This is bargain food nearing the buy before date. I try to do this with bread if I get to the supermarket at the right time (usually quite late or after 3pm on a Sunday). Then pop it all in the freezer. 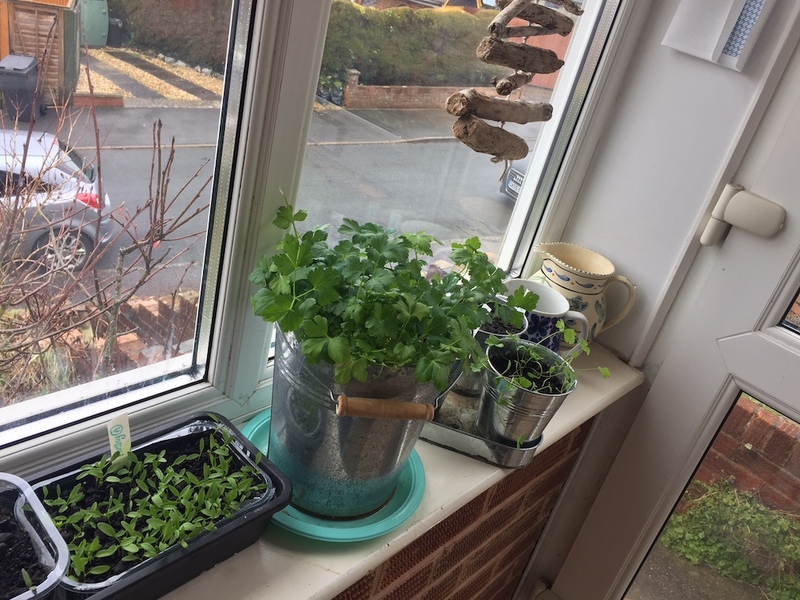 Growing your own food is something I do already (like growing herbs like mine below) but I could make more effort like Jasmine at Money Magpie explains. I am very lucky to have my own allotment here in Exeter but Money Magpie talks through how to grow pretty much everything on your windowsill – amazing! The Power of Frozen is going to help me stick to the budget next month thanks to the Shoestring Cottage blog. 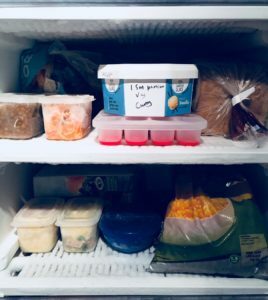 I already love my freezer picked up from Facebook Marketplace last year for just a fiver but I could make more use of it. According to Shoestring Cottage “Frozen vegetables are cheaper than fresh; you can use just what you need and they come ready chopped! It is also claimed that they are frozen very quickly after cropping so therefore contain more nutrients than fresh vegetables.” I already buy frozen peas and sweetcorn but I’m going to try out mushrooms, broccoli, cauliflower and red peppers this month to see if I can save some money and not be left with any veggies going squidgy in the bottom of the fridge! Holland & Barrett do some great offers on buy one get one half price and the penny sale and items which are close to their use by date – which Fiona reminded me of on her blog Savvy in Somerset. 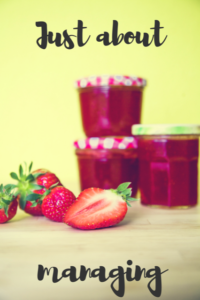 Fiona has written a whole post on ‘How to Spend less on Groceries when you’re Vegan’ check it out! So there you go, a veritable cornucopia of wisdom from the experts in the money saving blogosphere….I’ll stop overspending each month and get that mortgage deposit saved up in no time. Looking forward to hearing your comments on this too, especially love to hear any more fab tips. 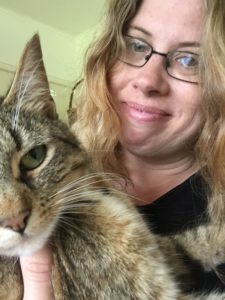 Don’t forget to subscribe to my newsletter for news on new vegan products, competitions, giveaways and discounts. Next post: New Vegan Chippy in Exeter! Great article. Thanks for the mention! Thanks for sharing this. So unselfish to share about others who are making headways and helping us with ways to save money on our food budgets for our families.